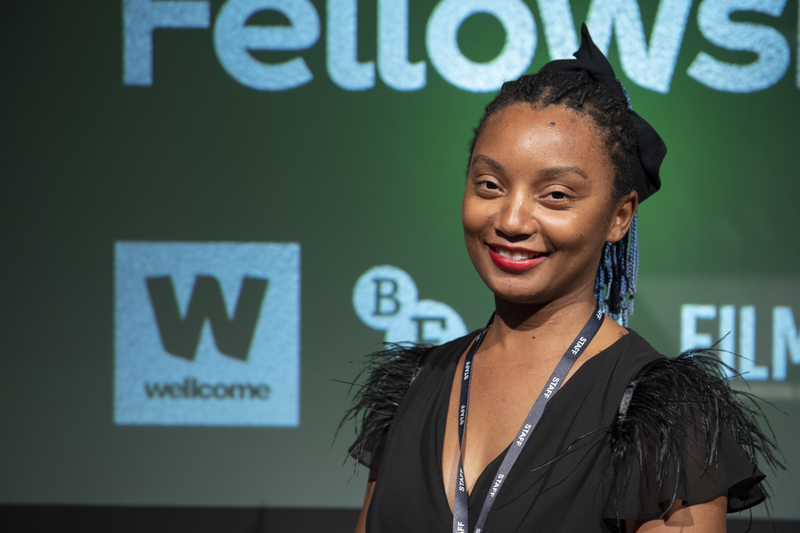 On 21 November 2018 at the annual celebration for the Wellcome Screenwriting Fellowship, in partnership with BFI and Film4, BAFTA award-winning Director/Writer Rungano Nyoni was announced as the 2018 Fellow. Now in its sixth year, the Fellowship gives a screenwriter of exceptional talent £30,000 to explore the intersection between screenwriting, health and science. Nominated by leading film and TV industry executives, this unique collaboration takes place without the constraints of a specific project. This allows the Fellow to gain inspiration and knowledge from Wellcome’s vast range of science and humanities resources, which includes access to research, meetings with leaders in the fields of science and medical history, visiting clinical centres and access to the Wellcome Collection. Fresh from winning her award Rungano spoke to Alt A Review. ALT: Congratulations on winning the Wellcome Screenwriting Fellowship, how do you feel about winning? RN: A little bit surprised flattered, it is a little bit surreal because it is an unusual award, I am kind of amazed about. That is probably the simplest way to put it. ALT: Your debut feature “I Am Not A Witch” has received many accolades what do you attribute this to? RN: I have no idea. The thing about film is you do not have any idea about how people are going to receive it. I am not sure if other people do. It has taken me awhile to understand how well the film did, it is better than I expected but I am not sure I had any expectations. I am not sure what it is down to, sometimes it is timing, sometimes the film must speak to people, something that touches them. That is a hard one to pin down. ALT: How did the story come to you? RN: The story was, it was kind of a mixture of things I was inspired by, I think a lot of my stories come from a place of anger. I think I was trying to find a way of talking about my idea of womanhood and the frustration of the limitation society places on women and misogyny. But I was not thinking about misogyny, it kind of ended up being that way I was trying to express something, and I was looking at a way of setting it in a witch camp, as for me this epitomises this idea and that was sort of how that idea came out. It was a tree approach from a seed it kind of grew from there, it really came from a place of frustration and anger over my limitations on things placed upon myself in a way. ALT: How did witchcraft come into the idea? RN: The reason that came up was because I spend a lot of time, my summers in Zambia and I noticed that there was a period in Zambia whereby there was a lot of witchcraft accusations and I started looking into it and I realised, I found it strange that a lot of them were around women, there was a kind of hysteria around women using their witchcraft. Then I realised it was a problem that extended across Pan Africa. What particularly interested me was it was almost always aimed at women. Some aimed at men but mostly women, older women and I was trying to figure out what that was about and if it was just the idea of scapegoating and using women as scapegoats because they are a vulnerable group especially older woman. I found that fascinating. ALT: Talking about the treatment of women it is the biggest conversation we are having right now in the film industry; do you think we are moving into a better time and any progress will continue? RN: I hope it will continue, but this happens a lot in our industry, people will suddenly realise oh no we don’t have enough women, it is like a cycle, a five-year cycle to get more women into the industry, even though there has been an actual push the change has been very little and I wonder why that is. Maybe we just need time, in five years we are going to know whether this has had a big enough impact and a lasting impact. I hope it does and the good thing is we are talking about and we are less embarrassed about and women are fighting their corner a little bit more and that is good. Last time this happened it was about a lack of training for women, we know exactly what we are doing we just need opportunities, they have left that initiative and are just about opening doors which I hope people can go through. I hope it does have a lasting impact but it remains to be seen. ALT: In terms of getting the Fellow, what are you going to do with the bursary? RN: What really excites me is you really do not have to do anything, there are no strings attached but I am going to be able to use their facilities and access to their scientists and experts in every field of medicine and science which is brilliant, I am already kind of thinking about ideas of what I can do, but I want to leave myself open to explore that world and see if it is something I can base a story around maybe. It is giving me the time to do research and explore it has given me something I really needed. After the first feature it is very difficult to figure out what to do next. This is unique very few grants give you the space to do that. I am so excited to us this time to research and explore. I am going to go through all the archives. ALT: Where do you call home? RN: It used to be London but is now it is Cardiff and Lisbon, when I am writing I go there to write, because great weather and cheap food. I live between Cardiff and Lisbon mainly. ALT: Do you have any idea what your next project might be? RN: (Laughs) No I have not idea, that is why this is perfect I was voted for by the industry so everyone I am meeting with knows really I have no idea and really I would like to use this opportunity to find something that fits me, hopefully I will, I think I will. Shula is the first child taken to a traveling witch camp, where she is told that should she cut the ribbon and attempt to escape, she will be cursed and transformed into a goat. If you would like to watch the film check it out here on AMAZON PRIME.